PAK Technologies, Inc. has made investments in order to provide our customers complimentary and comprehensive services for our valued accounts. We have obviously centered our strengths around blending and packaging, however we have capabilities in a number of related activities to provide the opportunity to make things easier for you. 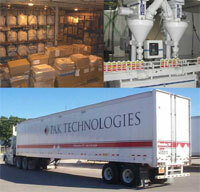 These include our own distribution services, our warehousing facilities and our international program. PAK Technologies, Inc. has worked with large international accounts, small local accounts and new product development accounts since its inception. This makes us uniquely qualified to address a wide range of situations. It also makes us very understanding and flexible in addressing the very specific needs of every customer.